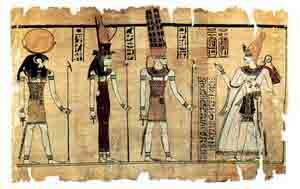 The Ebers Papyrus, a medical text that dates back to 1550 B.C., offers a number of recommended cures for ancient Egyptians suffering from baldness. Suggestions include a mixture of fats from a hippopotamus, crocodile, tomcat, snake, and ibex; porcupine hair boiled in water and applied to the scalp for four days; and the leg of a female greyhound sautéed in oil with the hoof of a donkey. Cleopatra experimented with a goo made of ground horse teeth and deer marrow to spur Julius Caesar’s dormant hair follicles into action. In ancient Rome, hair continued to be a symbol of power and virility and baldness a sign of weakness. This presented a problem for Julius Caesar, whose hairline was receding even as his empire was expanding. He developed some cosmetic solutions to his hair loss problem. First, he began growing it long in the back and combing it straightforward over his bald spot. Hippocrates swore by a mixture of opium, horseradish, pigeon droppings, beetroot, and spices for his baldness. Baldness – shave the head and smear onto the scalp the grease from a fox. An alternative treatment for baldness was to crush a garlic bulb and rub it into the scalp and then wash the scalp in vinegar. In 1654, with Oliver Cromwell ruling England, good health and grooming for men were somewhat more basic. Baldness remedy “Take the ashes of Culver-dung in Lye, and wash the head therewith. Also, Walnut leaves beaten with Beare’s suet, restoreth the haire that is plucked away. In traditional Indian Medicine, turmeric is considered to be a cure and hair growth stimulant when consumed in large quantities.